To call The Barefoot Mailman episodic would be understating the issue: the film's story stops and starts so often that it appears to be three half-hour TV episodes strung together. No matter, since the premise is workable and the characters appealing. Though Robert Cummings is top-billed as erudite 19th-century con artist Sylvanus Hartley, the title character, Steven Pierton, is played by Jerome Courtland. The film is set in turn-of-the-century Florida, which was then little more than an elongated swamp. It is the responsibility of Steve Pierton to deliver the mail by foot, covering the distance from Palm Beach to Miami. Attempting to elude the northern authorities, Sylvanus Hartley joins Pierton on his treacherous journey. Their travelling companion is Adie Titus (Terry Moore), a hoydenish young lady who disguises herself as a child to avoid unwanted advances. After saving Adie from the clutches of swamp outlaw Theron (John Russell) and his gang, Hartley goes off on a new tangent, bamboozling the local settlers in a highly suspect land-speculation scheme. When Theron and his fellow crooks lay siege upon Miami, Hartley and Pierton, despite their rivalry over the affections of Adie, team up to save the day. 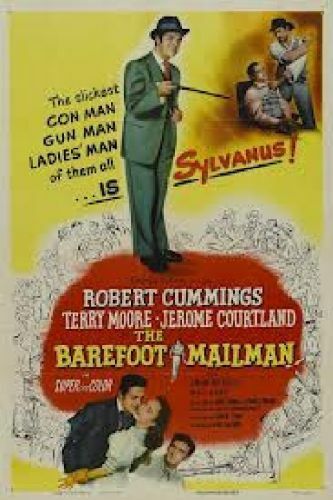 Nothing if not unusual, The Barefoot Mailman is based on a novel by Theodore Pratt.